A gorgeous recreation of the most famous transistor organ ever made, with plenty of modern add-ins taking it far beyond. Awe-inspiring accuracy. Excellent included effects. Good selection of amp options. Individual tuning of notes. Jennings model sounds terrific. Seriously, dirty key contacts? Neat! Intended as a road-friendly alternative to the massive tonewheel instruments that preceded it, the Vox Continental organ was a lean, mean machine. Its thin, piercing tone was much in-demand by the garage and psychedelic bands of the 60s, enabling it to cut through the squall of the amplified four-piece combo. Later, its very particular sound also endeared it to New Wavers and rock revivalists, helping it find its way onto cuts by bands as diverse as The Dave Clark Five, Spacemen 3 and The Horrors. 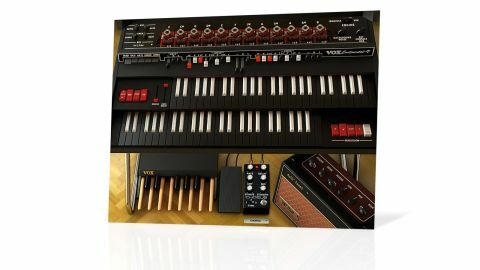 "Ultimately, it makes for a lively, expressive and - most important of all - musical instrument"
With its TAE-based physically modelled emulation, Vox Continental V (VST/AU/AAX/standalone), Arturia has managed to capture everything that made the Connie great in its day and rolled it up with some complementary effects and other enhancements. Physical modelling recreates the various components that make up a real-world device using purely mathematical models rather than, say, samples or subtractive synthesis, giving the developer the ability to - in theory - accurately recreate the subtle nuances of the hardware being emulated. Ultimately, it makes for a lively, expressive and - most important of all - musical instrument. At the most basic level, Vox Continental V presents a typical two-manual (ie, dual-keyboard) drawbar organ. Panel switches allow you to assign the manuals to separate MIDI channels, flip a single MIDI channel between the entire upper and lower manuals, or set up a keyboard split on a single channel. A MIDI multichannel mode is also provided, in which the manuals and pedal sections each respond to separate MIDI channels. There are rocker switches for activating Percussion (giving the sound a sharp, percussive quality), convolution Reverb, Tremolo and Vibrato, while a couple of sliders provide control over Reverb amount and Bass Decay. Speaking of bass, a click of the Bass switch brings out the bass pedals, which come with their own set of three drawbars. You can also add a MIDI-assignable Swell pedal. Amplification options include a rotating Leslie speaker, a nicely kitted-out amp model providing a variety of speaker and microphone options, along with EQ, overdrive and a spring reverb (with just an amount control), and direct injection (bypassing the amp model). That's the processing basics covered, then, but you can also call up any one from a complement of built-in stompboxes: Flanger, Phaser, Chorus, Analog Delay, Overdrive and Wah. Each of these has a handful of editable parameters of the kind you'd expect to find on standard hardware, and they sound excellent - particularly the delay, with its built-in LFO and tone controls. We do wish we could use more than one at a time, though. As ever, Arturia's included presets are excellent, with all of the expected classic Vox timbres ticked off, as well as some surprisingly clever special effects and a couple of halfway decent string machine emulations. The presets do a good job of demonstrating the instrument's versatility and signature sound. And what a sound it is! Vox Continental V exudes all of the life, grit, breath and wheeze of the real deal. It's an uncanny representation that inspires psychedelic jams, blues workouts and soulful Motown grooves alike - you can almost smell those old transistors heating up.